Aiseesoft iPod to Computer Transfer Ultimate is one of the best iPod mates which aims to help you export all iPod files, including music, movies, TV shows, podcast, iTunes U, ringtone, ePub, PDF, audio books, camera roll, picture, voice memos, and camera shot, to computer without losing anything. Also it allows you to backup iPhone SMS(MMS) and Contacts to computer. Moreover, it is highly compatible with the iPhone 4S and iOS 5 after upgraded. 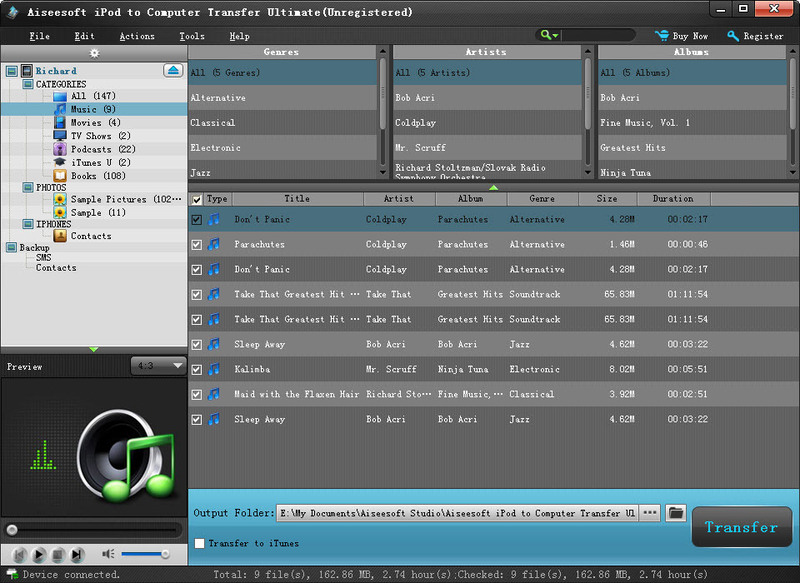 Export iPod music/movie/podcast/ringtone/ePub/PDF/picture/iTunes U,etc to PC. Aiseesoft iPod to Computer Transfer Ultimate enables you to output iPod music, movies, TV shows, podcast, iTunes U, ringtone, ePub, PDF, audio books, camera roll, picture, voice memos, and camera shot to your PC. This iPod Transfer highly supports iPod, iPod classic, iPod mini, iPod nano, iPod shuffle, iPod touch, iPhone, iPhone 4S, iPad and iPad 2. This software can help users transfer iPhone SMS (MMS) and Contacts to computer. And you can choose to transfer some specific SMS/Contact or transfer all of them. You are able to preview the video and picture within your iPod before transferring. The "Track Filter" function can help you make your backup in a good order and find your profile easily. Qweas is providing links to Aiseesoft iPod to Computer Ultimate 6.1.32 as a courtesy, and makes no representations regarding Aiseesoft iPod to Computer Ultimate or any other applications or any information related thereto. Any questions, complaints or claims regarding this application Aiseesoft iPod to Computer Ultimate 6.1.32 must be directed to the appropriate software vendor. You may click the publisher link of Aiseesoft iPod to Computer Ultimate on the top of this page to get more details about the vendor.